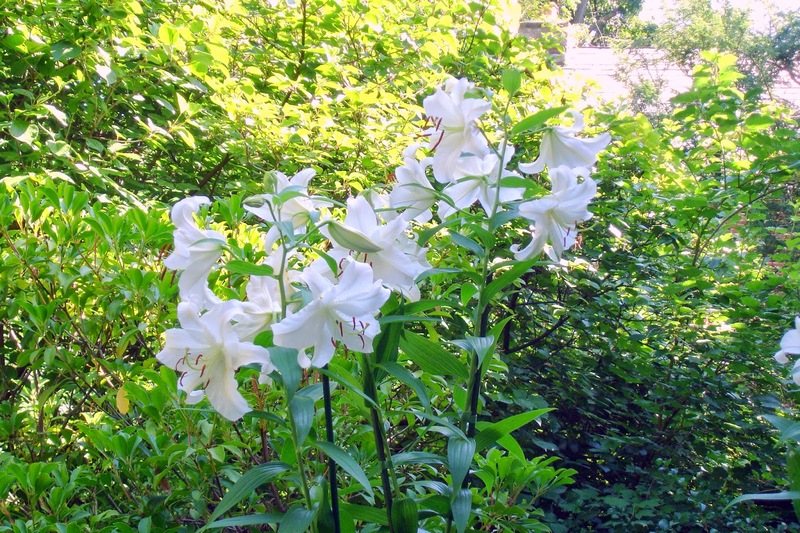 Gardening for Fragrance: Nothing Tops Casa Blanca! 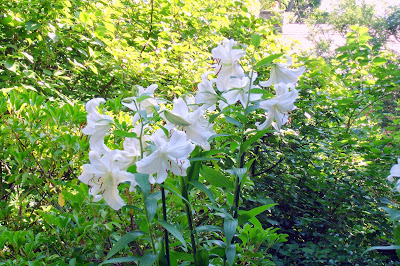 For me, the high point of the garden season is mid to late July when the oriental lilies bloom. The most spectacular of all is Casa Blanca with its intoxicating fragrance. Sadly, the evil groundhog which has destroyed my phlox has also chomped away at some of my oriental lilies, but fortunately he left some for me. If he destroyed all my Casa Blanca lilies I’d be out there with a shotgun! Anybody have any ideas for getting rid of groundhogs?? 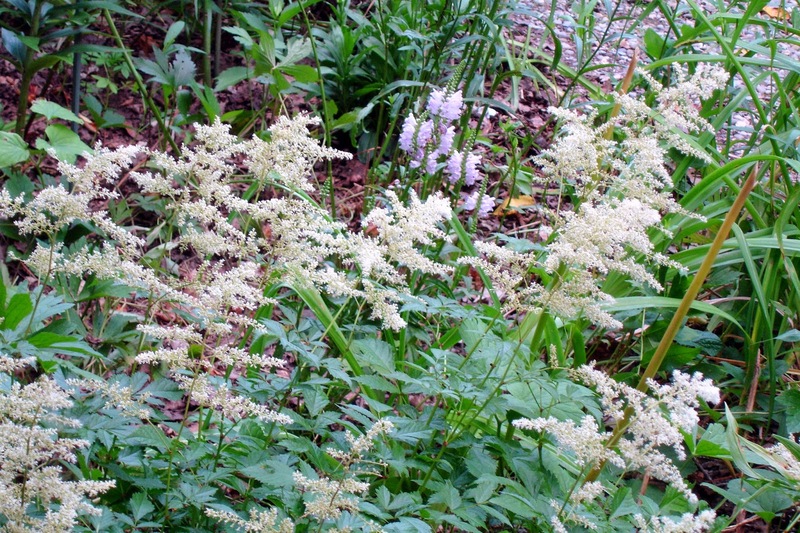 Foliage matters or how I learned to love Astilbe. When I first started gardening I was infatuated with brightly colored, showy flowers. The garden I inherited was filled with phlox which were spectacular for the first few weeks of their long season of bloom. Then came the spider mite and the powdery mildew and my phlox-filled garden became a garden filled with diseased foliage. But despite the phlox problem, I kept falling for the showy flowers— e.g., the cherry red flowers of monarda which really brighten up a gloomy corner but soon become a mass of ratty foliage covered with powdery mildew or the spectacular flowers of hollyhocks which inevitably succumb to hideous rust. 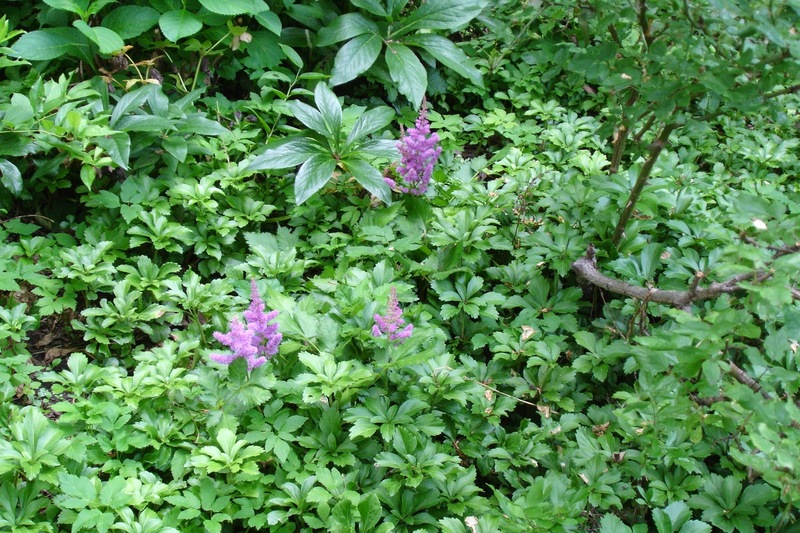 It took me a long time to accept the fact that the flowers of my perennials last for a short time, but the foliage hangs around the entire season. Now I have banished monarda and hollyhocks and greatly reduced the phlox. 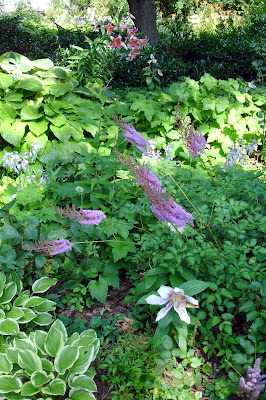 An evil groundhog is also destroying my phlox and I am slowly replacing them with plants with graceful foliage like Astilbe. 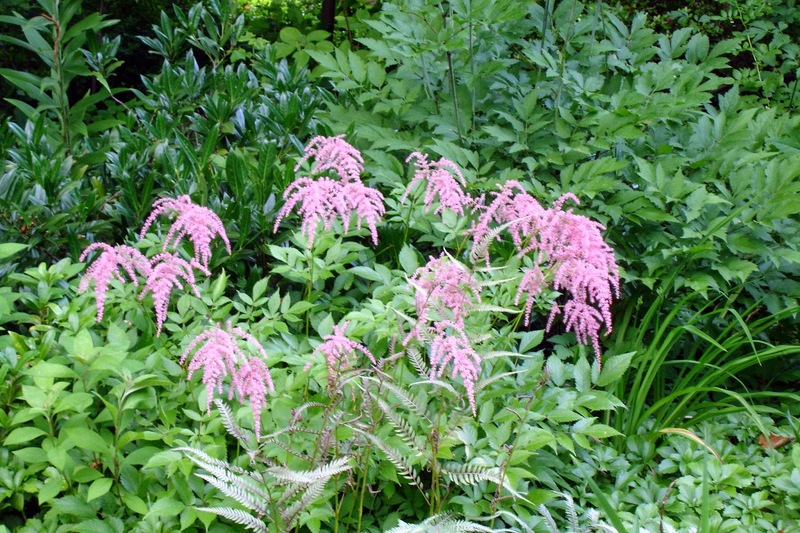 Among the many advantages of Astilbe: they bloom in deep shade, require little care, are easily divided so that you can increase your stock very quickly. They also have a long season of bloom with varieties which bloom in early June, mid-June early July and mid-July. The very first is Bridal Veil pictured above. 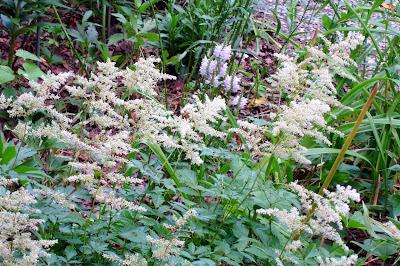 Its bright white plumes brighten up dark corners of the garden, and instead of turning horribly ugly on it is way out like so many perennial flowers, Bridal Veil fades gracefully to a cream color before turning brown late in the season. Ostrich Plume blooms in mid-June with bright pink plumes fading to pale pink before turning brown. But even when it has turned brown, the delicate plumes still have ornamental value and even persist through the winter. 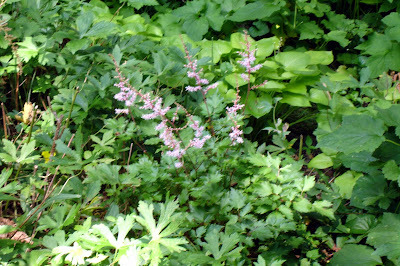 The last astilbe to bloom in my garden is just beginning now. It's a plant I bought last fall so I don’t quite know what to expect. 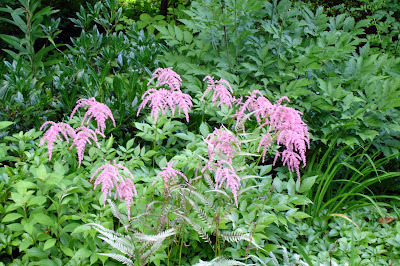 It looks like the plumes will be pale pink and the foliage is the most beautiful of all with finely cut leaves and not a speck of powdery mildew. 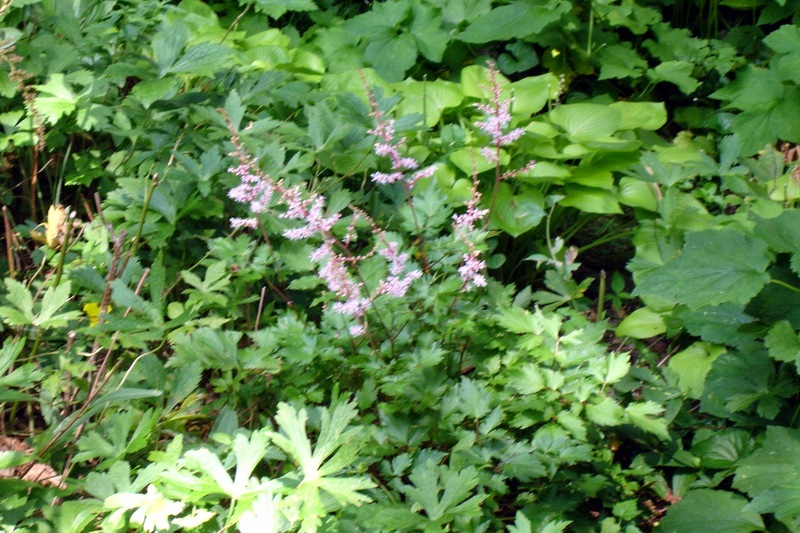 Astilbe is now at the top of my list for most useful plants. I’ll never fall in love with it the way I have with my oriental lilies, but I sure do appreciate its virtues. Yucca can bloom in deepest, darkest shade! We have been gardening on his plot of land for 22 years. 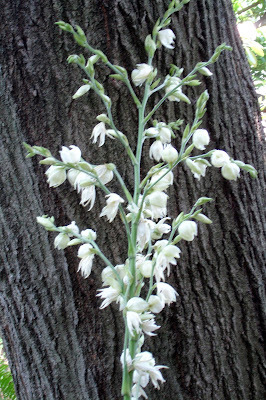 Many years ago a yucca plan tucked away in a dark corner of our garden bloomed. It was a one-time event and we never expected to see the yucca again—after all they’re supposed to be sun-lovers. It was too big to move, so we just accepted it as a foliage plant--and the foliage is impressive. But for some unaccountable reason, this year the yucca decided to bloom. The conditions haven’t changed; it’s still in deep shade. So how account for this? Anyone out there with an explanation?